I love reading reading parenting books as they really helps us in many ways. I read them so that can take good care of my Nephew Devansh and understand him better. Recently I read this book Ultimate Guide To Modern Parenting By Pradeep Kapoor and NeelKamal Kapoor. After reading the interesting blurb, I instantly decided to pick up this book. The need for close ties remains throughout life, but becomes especially important in times of stress or crisis, eg. during exam. Failing in interview is a crisis, which can be overcome easily, if the parents are forthcoming with their love and support. I found this book really helpful and it really is an ultimate guide to Modern Parenting. 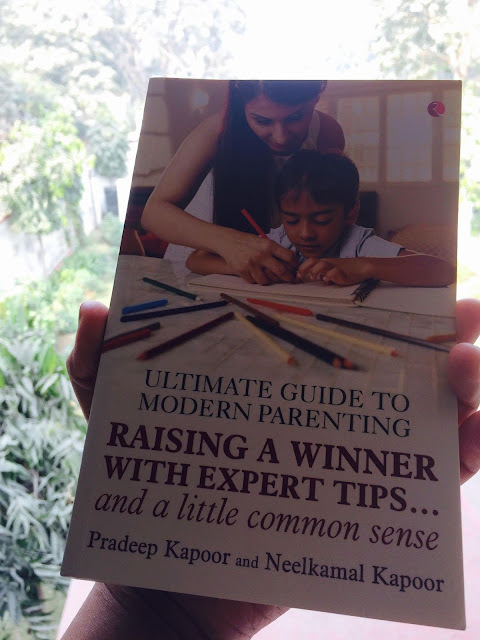 This book guides us in raising a winner with some really amazing and practical expert tips. It tells us in details the importance of the role of everyone including parents, teachers , peers and home environment and classroom environment helps in shaping the personality of children. The Authors advice readers not to use cristicim and use praise for children. How we should not confuse children and let them do things at their speed. How parents-teachers meeting plays an important role in studying the behaviour of child. It tells us what kind of attitude we should keep while dealing with children and it suggests that we should opt for mild attitude and milder vocabulary which usually produces the desired result. The book focusses on the importance of demonstrating your love to your kids and showing them you care and expressing your feelings. It says that if you don't give love today, your child will not learn to receive it tomorrow-neither from you, nor from anyone else. I completely agree with this thing. It has been observed that such children are non-demonstrative themselves and may have unproductive relationships, in later life. How a good vocabulary is a must for the proper expression f emotions and to sustain communication. When children are unable to correctly verbalize their internal feelings, they are likely to become frustrated. Frustration may cause behavioural problems and destructive tendencies. So it is really important to observe their non-verbal reaction. We should all try our child have an easier time communicating to us so that there will be good chance of identifying and dealing with the child's problems. There are many more such helpful tips and advices for everyone. Definitely recommended! A gold medalist, Pradeep Kapoor (MBBS, MD) is a pediatrician based in Bhopal. He is an established name in the field of parenting, having written several successful books on the theme. His first book, Make Your Child a Winner, was a bestseller and has been translated into seven languages. His novel, Fosla, a humorous take on life in a medical college, was a rage among readers, both young and old.